View of Pluto captured by NASA's New Horizons spacecraft on July 14, 2015. A new video takes armchair explorers on a flyover tour of Pluto's stunning and varied landscapes. 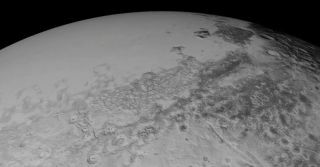 The new Pluto tour animation stitches together photos captured by NASA's New Horizons spacecraft during its historic flyby on July 14, which returned the first-ever up-close looks at the faraway dwarf planet. "While this is my research focus, another interest of mine is figuring out how to make visualizations that convey some of the sheer beauty and power of the features New Horizons is revealing," Robbins added. "With that in mind, I've created a new animation/flyover of Pluto using images returned this month by New Horizons." The video tour features resolutions ranging from 1,300 feet (400 meters) per pixel to 1.3 miles (2.1 km) per pixel. The animation takes viewers as close to Pluto's surface as 120 miles (200 km) and zooms out to an altitude of more than 1,500 miles (2,500 km), Robbins wrote. This apparent proximity is provided by New Horizons' telescopic camera, for the probe itself did not actually get so close; New Horizons zoomed past the dwarf planet at a minimum distance of 7,800 miles (12,550 km) on July 14. Earlier this month, New Horizons began beaming home the vast majority of the images and data collected during the close encounter. Mission team members said they expect this relay work will take about a year to complete. So space enthusiasts can look forward to seeing many more great new images, and videos, of Pluto in the future. "The concept of this animation arose from a desire to showcase the most recent imagery received from the spacecraft and the huge variety of terrain types that we see on Pluto," Robbins wrote. "I can hardly wait until we get even better imagery — up to seven times better pixel scale — that's still to come of select areas of the surface and to see what new surprises Pluto has in store."